There is no better role model for aspiring radical scribes than Juan Gonzalez. The country’s leading Latino journalist is cohost of DemocracyNow!, a former columnist for the New York Daily News, and twice winner of the Polk Award for his investigative reporting. Not many veterans of campus and community struggles in the Sixties and workplace organizing in the 1970s later moved into mainstream journalism with such distinction, Gonzalez has managed to combine daily newspapering with continued dedication to the cause of labor and minority communities. Gonzalez’s movement background and intimate knowledge of New York City politics makes him an ideal chronicler of the unexpected rise (and near fall) of Bill de Blasio as a city hall reformer. In Reclaiming Gotham: Bill de Blasio and The Movement to End America’s Tale of Two Cities (New Press, 2017), the author situates New York City’s current mayor within a “new generation of municipal leaders” whose election reflects a broader “grassroots urban political revolt” throughout the United States. In that political cohort, however, de Blasio’s personal history as a Central America solidarity activist and, in the 1980s, “ an often disheveled admirer of socialist ideas” makes him fairly unique. 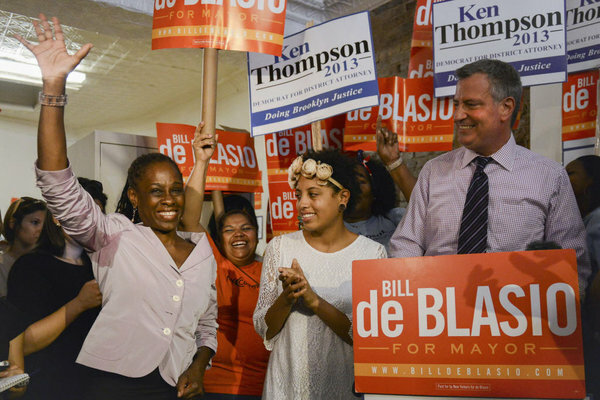 Nevertheless, when de Blasio, a former school board member and city councilor from Brooklyn, announced his candidacy for mayor, “few political experts gave him any chance of victory.” Much union money flowed to two leading rivals: City Council Speaker Christine Quinn, a Bloomberg enabler who watered down paid sick leave legislation, and former city comptroller Bill Thompson. Both stumbled on the campaign trail while de Blasio, then serving as NYC Public Advocate, tapped into anti-corporate sentiment magnified by Occupy Wall Street, plus mounting concern about “stop and frisk” and other forms of police abuse. Voters chose an even more radical African-American woman, Letitia James to replace de Blasio as public advocate…and they propelled nearly twenty candidates into the city council who had been backed by a small yet influential left-oriented third party, the Working Families Party. After this sweeping collective victory, de Blasio told a British Labour Party audience that he “became mayor because everyday New Yorkers were hungry for a clean break from the status quo.” He declared himself uninterested in “policies of timid maintenance” and announced his intention “to take dead aim at the crisis of our time, economic inequality. There were many obstacles in his path. Among them was a nervous Wall Street; its always reliable corporate tool in Albany, Governor Andrew Cuomo (also backed by the WFP); the charter school and landlord lobby; state legislators united in their bi-partisan disdain for any reform emanating from downstate; and the rabid hostility of local media outlets and NYC police union leaders. To make local progress, de Blasio relied heavily on a post-campaign “brain trust” of mixed provenance, including “skilled technocrats with decades of experience managing major public agencies” and “a slew of progressive labor and community activists.” Among the latter were close associates of Jonathan Rosen, de Blasio’s friend and campaign policy advisor, whose consulting firm, BerlinRosen, represents “some of the city’s biggest real estate companies, all of which have major business interactions with city government.” (The firm’s co-founder, Valerie Berlin, is a former staffer for ACORN, a past de Blasio ally that became BerlinRosen’s first client.) By styling himself as public relations man, Rosen skirted legal requirements that lobbyists register with the city and file annual reports on their clients and contacts with city agencies. he could fight the system while also depending on key figures within the system; that he could seamlessly combine grassroots neighborhood activists and labor leaders of all stripes with a major wing of the Democratic Party’s neoliberal “growth” machine of consultants, lobbyists, and wealthy donors, many of whom typically regard proximity to political power as a way to make money, not matter who is in charge. Nevertheless, de Blasio displayed little personal hunger for “a clean break with the status quo.” He briefly delayed endorsing Clinton, and according to the author, that “put unexpected pressure on her to align more with Sanders program”—a feint to the left more likely motivated by her mounting primary losses. The Working Families Party, which helped elect de Blasio, polled its own rank-and-file supporters and, based on those multi-state results, endorsed Sanders. Few WFP-backed city councilors or allied unions followed its lead. Only three Democrats out of forty-eight on the council supported Bernie. Even seventeen out of nineteen Progressive Caucus members on the council backed Clinton, calling their own anti-establishment credentials, on national issues, into question. The mayor was hounded for more than a year by press accounts that depicted him as corrupt, and during that time he was unable to enact the kind of bold reforms that marked his first two years in office. The damage to his reputation among some voters was likely to endure. Gonzalez himself no doubt breathed his own sigh of relief when Vance concluded that de Blasio did not personally profit from any city action on behalf of privileged contributors. The uplifting narrative of Reclaiming Gotham would have become far muddier amid indictments, pending trials, and a 2017 mayoral race full of Democratic primary challengers and general election foes seeking to oust a scandal-scarred incumbent. I expect that other Reclaiming Gotham readers will similarly conclude that real Bernie Sanders-style progressives (or those trying to run even further to the left?) should not employ people with such divided loyalties. If your campaign helpers (and later city hall staff) include members of a “new class” of political consultants as dollar-driven and ethically-challenged as their old-school predecessors, you and they will not be creating a “radical experiment” in “people’s government.” In fact, any policy advice, dispensed by such strategists—particularly on housing and development issues–will reflect the interests of their current business clients far more than any past personal ties to labor or community organizing. Under de Blasio, nimble practitioners of “pay-to-play” were quick to monetize their city hall access and influence — all to advance the “progressive agenda,” of course. Gonzalez’s account of this activity brings to mind the Teamster election scandal twenty years ago that did bring down the most left-leaning administration in that union’s history. Teamster President Ron Carey, a reformer backed by Teamsters for a Democratic Union, made the mistake of employing headquarters staffers and political consultants who decided that illegal campaign fundraising and money-laundering “donor swaps” were necessary for Carey to beat an election opponent named James Hoffa. The results for Teamster reform were disastrous. They included Carey’s removal from office, Hoffa’s eventual election (and continuing presidency), guilty pleas by the consultants responsible, the conviction and jailing of the union’s political director, and Carey’s own indictment on charges that federal prosecutors failed to prove at trial. Citizen Action, an ACORN-style group implicated in the scandal, collapsed soon afterwards, with its own previously admirable reputation ruined. The role of big money in electoral politics–whether it comes from entrenched foes of union reform or corporate interests long dominant in a major city–cannot be overcome by cutting corners. Corporate influence in government (and related “hack behavior”) will not be reduced anywhere if other progressive candidates are unwilling to follow Bernie Sanders’s example of running “corporate-free” (and groups like the Working Families Party fail to make candidate rejection of business donations a pre-condition for their endorsement). Of course, New York remains a place where it’s hard to level the electoral playing field entirely when a billionaire media mogul like Michael Bloomberg can, as Gonzalez reminds us, spend $250 million of his own money to prevail in three straight mayoral elections, over-turning a previous two term-limit in the process. But, as demonstrated over the last decade, on a much smaller scale, in Richmond, California, local campaign finance reform, grassroots organization building, and real people power can still be a winning combination against foes as wealthy and powerful as Big Oil. Draining our many local swamps, of corporate influence or outright political corruption, is no easy task in municipalities of any size. Reclaiming Gotham includes thumbnail sketches of urban reformers in Richmond, San Francisco, Seattle, Chicago, Newark, Philadelphia, Austin, Texas and Jackson, Mississippi that illustrate the range of possibilities for bottom-up change in many different settings. The author’s deep understanding of how city hall works and for whom — under proprietors new and old — could not have been put to better and more timely use. When rank-and-file “supporters” and “followers” have organizational mechanisms to hold leaders accountable, either in unions or labor-backed political formations, the risk of such outcomes are somewhat reduced. But, when a big city mayoral candidate who progressives have championed gets elected, does much good, but less than expected on some fronts, what exactly is the grassroots mechanism for securing course correction during his second term? Perhaps we’ll find out, after Bill de Blasio, as expected, is re-elected in November and sworn in again next January. Let’s just hope that Bill Clinton won’t be doing the honors again, with Hillary at his side. These friends of the mayor symbolize, better than any other corporate Democrats, the “policies of timid maintenance” which de Blasio so disdained, in 2013, when speaking to a British Labour Party since rallied by a real agent of change (albeit one without a big city to run).